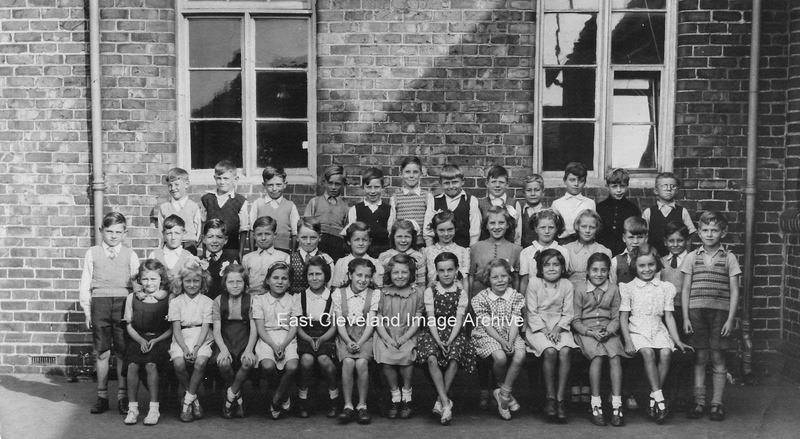 The infants’ class of 1948. Back row (left to right): Alan Bonas, Neil Morley, Michael Boothby, Owen Laffey, Leslie Smith, Michael Endean, Armin Wilson, Gerald Kitchener, Ian Parks, Keith Watson, Arthur Fowler, Kenneth Keeler. Middle row: Derek Dauncey, Arthur Payne, Geoffrey Hudson, Rodney Tomlinson, John Sleeman, Frances Batterbee, Hilary Cole, Margaret Wilson, Irene Codling, Elizabeth Endean, Pamela Richardson, John Whiteley, Alan Burluraux, Owen Rooks. Front row (seated): ?Dent (I think), Janet Wynne, Eileen Webster, Ann Ruddy, Joan Robson, Evelyn Johnson, Sheila Harrison, Eunice Smurthwaite, Brenda Yeats, Christine Whitehead, Sheila Agar, Marjorie Butler. Image and names courtesy of Owen Rooks.